Just a few days after I wrote that I ‘hardly ever shop in town these days’ I found myself on a rare lunch break prowl in Cardiff City centre looking for the basic ingredients of an evening meal for two of my East Side ladies Del Roath, Alice and Emma. I stopped at Pipi’s Greek Café and Deli to get my two basic ingredients: filo pastry and lots of feta cheese. Pipi’s is run by first and second generation Cardiff Corfu-ites and stocks a good range of Greek products in its Deli corner ranging from various types of Feta (Vermio, Dodoni, Kolios), to olives, Greek pasta and even kourampiedes. Filo pastry is sold frozen to retain its moisture and freshness but needs to be thoroughly defrosted in room temperature before cooking, so my timing was perfect: 5 full hours for defrosting at work were allowed but 2 hours in warm room would have been enough. Feta cheese is one my favourite ingredients and literally translates to slice. 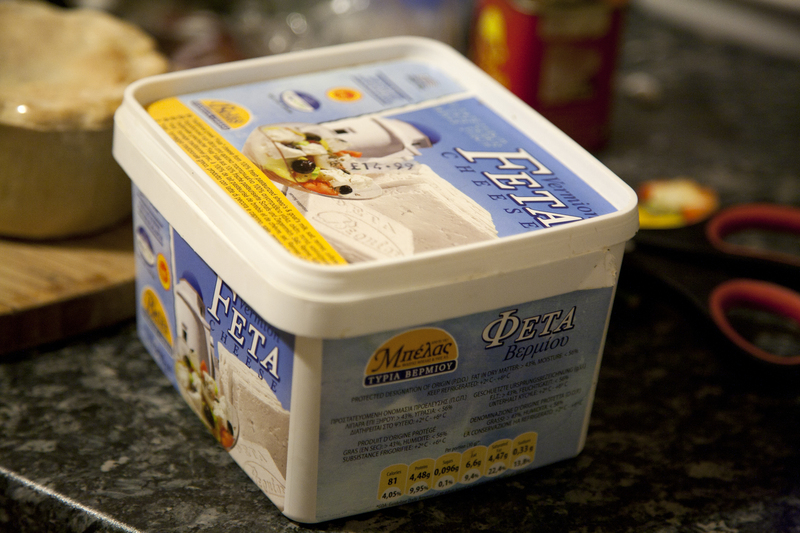 Although it is usually just made of ewe’s milk, there are as many varieties of feta as its producers and regions of Greece. It can be creamier or crumblier and sometimes with a strong hint of sweetness depending on the hillsides and pastures the sheep or goats graze on. For my pies Pipi’s offered me feta from Vermio, North West Greece and filo pastry imported from near Thessaloniki where I was born and raised. On my way back to work I stopped at Cardiff Central Market in haste. I love visiting this beautiful Victorian market building that is home to one of the few remaining fishmongers in Cardiff and where, at its 1st floor balcony, quality LP lovers are at luck. Unfortunately, last week, I only had time to stop for some salad leaves and cherry tomatoes. Alice and Emma are my neighbours. I forget how long I have known Alice for and it seems irrelevant. We haven’t always socialised regularly. I have worked, danced, talked and shared food, and most importantly shared moments of my life with Alice, and that I always enjoy doing with this lady. And Emma, who I met through Alice, I have just known for a few months only but I really enjoy getting to know her. For this first episode of Ladies Del Roath I prepared two different pies, one with leek and cheese and another with olives and rainbow chard. We savoured the pies with lettuce and tomato salad, a bottle of Primitivo red wine from Puglia, Italy and in the musical company of Eartha Kitt and Dinah Washington. Leek and cheese pies had rarely been just that at our home when I was growing up as mom would usually add spinach or other wild greens. But for my version of a leek and cheese pie I used 1 onion and a gigantic organic leek (the equivalent of 4 medium leeks). I sautéed the finely sliced onion in some olive oil , a pinch of salt and a tea spoon of unrefined caster sugar until it almost caramelised. I added the thinly sliced leek and cooked for another 5 minutes or until it was softened. After cooling the mixture I crumbled 250-300gr of feta in and added plenty of freshly ground pepper. I added 2 beaten eggs, as usual, but this time I also added two tablespoons of crème fraiche for a creamier filling. You can also use yoghurt or skip this step. For the olive and chard pie, I sautéed a finely sliced leek, threw in 5-6 halved cherry tomatoes and about 100-150gr of roughly chopped pitted olives (preferably Kalamata variety but other similar types of brown olives will do), and added 500gr chopped rainbow chard (stalks removed) to cook for about 10 minutes. Sometimes I like using rainbow chard instead of spinach because of its tenderness, mellow flavour and beautiful colours. I find it regularly at Roath farmers’ market at the Blencaemel Farm stall. Whilst the fillings were cooking I prepared the pie dishes. In my kitchen I use 25cmx 30 or 35cm baking trays for pies. I separate my filo pastry pack leaves in half: for the bottom and the top half of the pie. For 2 pies I used 2 packs of Greek imported filo pastry. I use at least 12 filo pastry leaves for each pie. Most imported pastry packs have 12 or more leaves but the ones you get from supermarkets like Sainsbury might only have six. Lightly oil the baking tray with a brush before laying the first pastry leaf and then continue by lightly oiling each filo and continuing to layer the first half of the pie (6 or more leaves). I prefer that the filing goes in the middle and then I lay the rest of the pastry leaves as before. You might find other recipes, which require more filling added every couple of leaves. At the end of the layering process I always fold the edges of the pastry leaves in to secure the filling and create a pie crust. I get rid off excess filo to avoid a dry and flaky pie crust. To finish off the pies for our ladies Del Roath meal, I tried two different toppings. For the leek and cheese pie I melted a knob of butter in 4 tbspns of milk and poured that on the pie starting from the crust edges and topped with sesame seeds. For the olive and chard pie I glazed with some beaten egg and tipped any excess off. Before putting the pies in the oven I pre,cut them into 6 large portion. This allows better cooling down and easier serving after the pie is cooked. The pies cooked in a preheated oven for about 30-45 minutes, at 170-180 Celsius or Gas Mark 4. If the pie browns too quickly cover with some aluminium foil. And please make sure that the bottom of the pie is cooked before removing. These ingredients made 12 large portions of pie. There was plenty left over for one hungry man and lunch for two the next day. Note: I take most recipe cooking times as indicative as ovens differ. My oven is unreliable so I have learnt to adjust cooking time and temperatures. I always set an alarm to go 10 minutes before the indicated cooking time to double check that everything is still going to plan. This entry was posted in Greek cuisine, Recipes, Review and tagged cardiffmarket, dinner, filopastry, greek, greekpie, kalamataolives, ladiesdelroath, lunch, midweekmeals, pipi'scafe, pipi'scardiff, primitivo, puglia, rainbowchard, recipeswitholives, Roath, roathfarmersmarket.